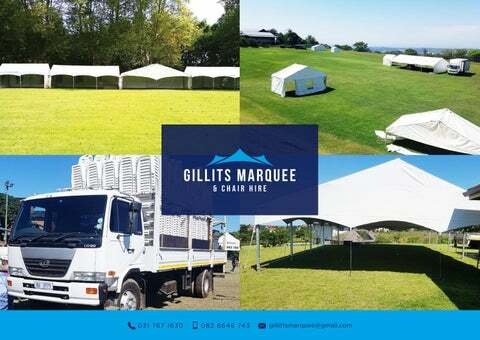 WELCOME At Gillits Marquee & Chair Hire we specialize in the hiring of white framed tents and event furniture. We’ve been in the business for over 10 years and have a hands-on approach to ensuring everything runs smoothly. Our enhanced service ensures that we are leaders in the hiring industry. Our vision is to provide quality service that exceeds our customers’ expectations. We strive to build long term relationships with our clients and provide exceptional customer service and believe in treating our customers with respect. We invest in the latest innovation and technology and grow through creativity, invention and innovation. Honesty, integrity and high ethical standards are our core values. WE STOCK A WIDE RANGE OF FRAME TENTS FOR EVENTS AND FUNCTIONS! CORPORATE AND SCHOOL FUNCTIONS, BEER FESTS, FLEA MARKETS AND CHURCH CRUSADES. â&#x20AC;&#x153;We go the extra mile. No job is too big or smallâ&#x20AC;? WHAT SETS US APART We have a strong base of key clients and are continually expanding regionally, offering new services and improving our existing offerings. Our motto says it all: We go the extra mile. No job is too big or too small.